Any firm can look good in front of its client when a project is going smoothly and the budget is more than sufficient to complete all objectives. The firm looks good for bringing the project in under budget while accomplishing more. But what if tight budgets do not allow an Owner to accomplish the amount of work that is desired, and he has more needs than there are funds? And to top it off, when the bids come in, he is enticed by that low bid number despite experience telling him that something is likely missing. More often than not, the client will take a chance, or has no lawful reason to reject the low bid. Often, the contractor’s quality is sub-par as he attempts to cut costs to make up for the low bid thus resulting in reduced quality or increased costs to the Owner for monitoring and managing of the project. Construction schedules suffer, and unpleasant conversations take place to bring the project back on track. Clemson University found itself in that very scenario during the roof replacement for the University’s iconic Brooks Center for the Performing Arts. 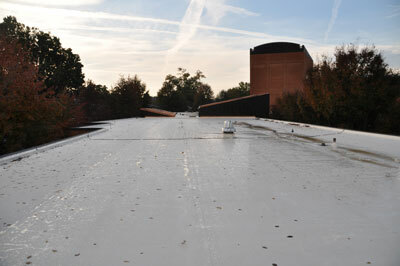 Clemson University desired to have complete tear-off, upgrading of insulation, and replacement of the roof. 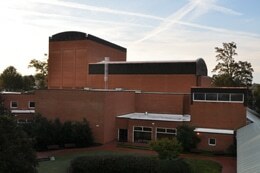 When first approached to perform the Brooks Center roof replacement design, the Terracon team conducted field work to establish the project needs and quickly determined the university’s $600,000 budget would not adequately cover the costs of complete removal and replacement of the structure’s 20-year-old roof. Additionally, Terracon performed destructive testing of the masonry and determined water intrusion was also related to poorly installed through-wall flashings. These would need to be corrected to assure wall leaks did not occur once the new roofing system was completed. This would add costs to an already tight budget. Terracon presented a viable option to Clemson University. After much research and conversation with the South Carolina Office of the State Engineer, Terracon performed a moisture survey using thermal imaging followed by destructive testing to determine the quantity of wet insulation. The majority of the existing insulation was dry, and could be reused in the roofing project. The savings associated would allow for roof membrane replacement at all areas as well as accomplishing through-wall flashing replacement at walls above roof levels. The roof membrane installation was designed as a mechanically attached system which further reduced labor costs and adhesive material costs. With a new roof system design and identified cost savings bringing the project within Clemson’s budget, the project went to bid. Four bidders came in under the budget. The Low-Bid was significantly less than the other three. The Low-Bid was a firm unknown to both Terracon and the University. Once work began, the Terracon team conducted periodic inspections of the ongoing roofing work. During an inspection, the team identified through-wall counterflashing installation that was not completed in accordance with the documents and did not meet industry standards. Through-wall flashing that is not installed correctly may allow water intrusion into the roof system as well as the building interior space. Through-wall flashing is flashing that is embedded within the wall and bridges wall cavities to divert moisture that penetrates masonry walls away from the cavity and back to the exterior. At roofs, through-wall flashings are placed above the roof system flashings, and can be used for attachment of the roof metal counterflashing. End dams must be placed at key locations to ensure moisture does not run off the ends of the through-wall flashings and into the building. 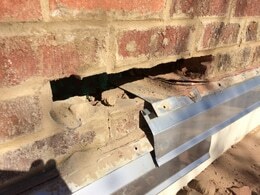 The through-wall flashing work cannot be observed once the masonry is installed. Due to observations of deficient through-wall flashing of ongoing work by Terracon during periodic site visits, destructive testing was performed at random locations to determine the general quality of installation where through-wall work was completed. The contractor’s position was that the through-wall flashing was installed per the design documents and no leaks had been reported to date. Once a report was issued with photographs showing deficiencies such as poorly installed end dams, unsealed laps and corners, and improper materials, the contractor agreed to correct the work. Due to schedule and work quality concerns, Clemson University engaged Terracon to provide full time inspection of the through-wall flashing installation. Terracon provided an RRC on site for approximately two months. Terracon facilities experts continued close contact with Clemson University, stepping up when needed to identify and resolve problems in a professional manner. The project began with a tight budget, took a hit with expensive and unexpected through-wall flashing work, endured contractor performance issues, but concluded with Clemson University’s objectives and budget being met. Terracon is experienced in working within budget constraints, providing viable options to the Client, managing contractors, and delivering an excellent final product to the Client.